Wow! These bright red pendulant blooms will certainly bring a much needed splash of colour to those shady areas of the garden. Big bulbs means big blooms! These brightly coloured Belgium Begonias will bloom from June until frost. Perfect for those shady spots their pendulant flowers are great for containers or mixed borders. To get a jump start on the growing season we recommend starting your tubers indoors for about 4 to 6 weeks. 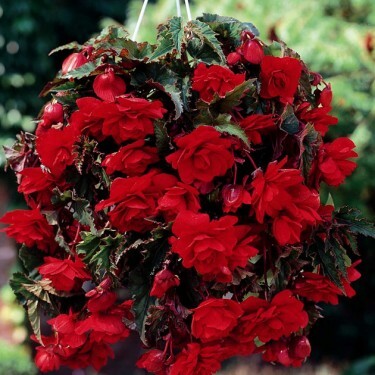 Remember, though, that Begonias are not winter hardy and cannot tolerate exposure to frost. In the fall, before the first sign of frost, dig up your tubers and place them in a loose bag of dry peat or vermiculite. Store them in a cool, dry place until replanting in the spring.